Imagine sitting down for your favorite growing up meal. The sight, taste, and aroma of those hallowed childhood dishes would stir up a cornucopia of delicious memories. Recently my friend Elizabeth cooked such a meal for her husband Charlie, who is living with early onset dementia. Charlie grew up in the 1950s, so Elizabeth bought a period cookbook. She and Charlie read through the recipes to see which ones he resonated with. “I will cook your favorites and we’ll invite a couple of your old friends from high school over for dinner,” she told him. Elizabeth is a terrific cook and Charlie loved this idea. They analyzed the potential entrees, Beef stroganoff, chicken Cacciatore, meatloaf, but Charlie kept returning to one page: the recipe for Johnny Marzetti Casserole. At first, Elizabeth demurred. As an accomplished cook, she didn’t like the idea of serving guests such a simple meal. But Charlie was persuasive, so she bought ground beef, canned tomatoes, cheese, and elbow macaroni. 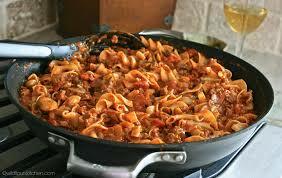 She cooked up a big pan of Johnny Marzetti, otherwise known as goulash, American Chop Suey, or macaroni and beef. Charlie and his friends went wild over the food and laughed as they shared memories of school, the neighborhood, their families, and favorite foods. The cookbook, the meal, and the cook were a huge success. Next on Elizabeth’s list: take pictures of Charlie with his favorite dishes and paste them in a scrapbook along with the recipes. What are some of your favorite childhood meals? For me, the desserts were most important. I adored cream horns, Mrs. Smith’s Lemon Icebox Pie, and Mom’s brownies and chocolate cake, particularly the icing. We still include Mom’s memorial brownies, courtesy of my brother, Chef Daniel Barnett, at family gatherings.